It is interesting to see the way things change as the light fades. Something quite unremarkable during the day can take on a whole new aspect when the sun goes down. Objects, buildings and even people can take on a mysterious, other-wordly air as darkness descends. In the dark, answers to our optical questions don't come so readily as during the daytime, and our curiosity is not so easily satisfied. 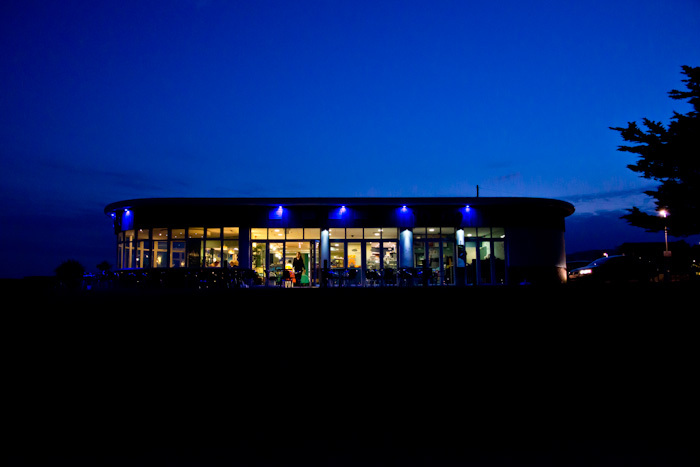 This is a beach-side café/restaurant in Dorset. Caught with just a fragment of the day’s natural light remaining, its own interior lights become dominant and more colourful. These new characteristics seem to draw-in our attention, to suggest there is something here worthy of further investigation. For the technically minded, this was shot at ISO1250, 28mm focal length, f5 and 1/60th second.